The Sri Lankan Railways formerly known as the Ceylon Government Railways has an eventful history of 150 years from the day the possibility of having a railways line from Colombo to Kandy and beyond was first discussed.By 1842, the necessity of the railway track was identified by the colonial rulers as the road alone was providing inadequate transport for coffee as there were not sufficient bullock carts or bullocks available. Moreover, it then took 12 days for a bullock cart to make the marathon journey of 72 miles from Colombo to Kandy. After a great deal of dialogue, the Ceylon railway company was formed in 1845, to build a railway line form Colombo to Kandy to meet the demand of planters. The railway track to Kandy was completed after 25 years from the time it was first discussed in 1942. The planters continued to demand extension of the main line beyond Peradeniya towards the hill country stations to serve the fast expanding plantation industry. The Badulla Railway line was completed in 1924. This line is considered to be one of the finest train journeys in the world in terms of engineering marvel and breathtaking scenery. 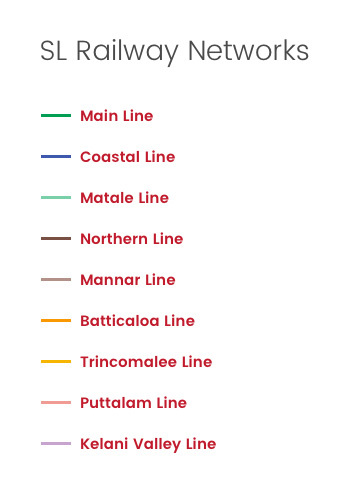 Encouraged by the successful operation of Colombo-Kandy mainline, the then government of principle decided to expand the railway network to various other destinations in the country, by the 20th century there were few other railway lines under construction. In 1902, the northern line construction commenced from Jaffna end and Medawachchi-Talaimannar was opened in 1914. By 1928 Trincomalee and Batticaloa light railway was completed. 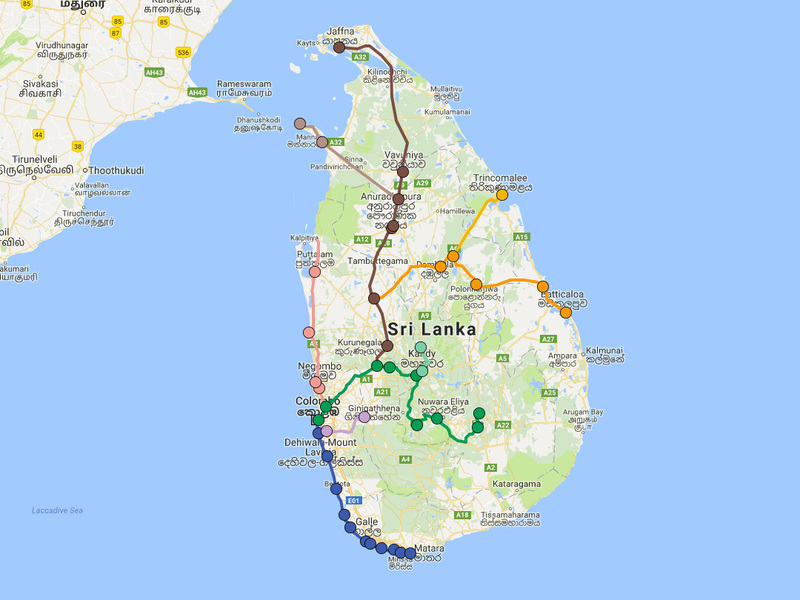 The line up to Puttalam was opened in 1925, thus completing a total length of 1453 km covering all the 09 provinces of country.